To tell a story is one thing, to tell a story and set it to music is another. 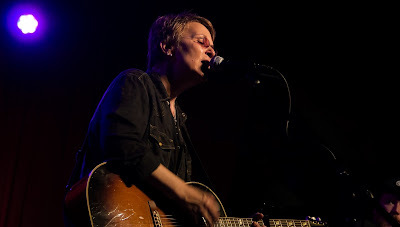 To do those two things very well is what Mary Gauthier does. And might I add she has done all of this in the short span of 16 years. At the age of 35, Mary decided to start writing music and playing guitar. In her short career, she has written enough material to fill eight albums and has won several awards along with critical acclaim of her works. To describe her style, I like to put it this way, "she is a female version of John Prine." So being familiar with her music, I was quite excited when I found out she would be at Off Broadway and knew I had to cover this show. Off Broadway decided make this an intimate, seated show, a good choice outside of the squeaky chairs. Accompanying Gauthier on this tour are Canadian musicians, Joanna Miller (drums) and Scott Nolan on (guitars and keys).